Is the USA one nation, indivisible? Colin Woodard, a journalist and historian, claims that the United States of America is not a unified nation, but an arena of struggle among separate and distinct regional cultures. 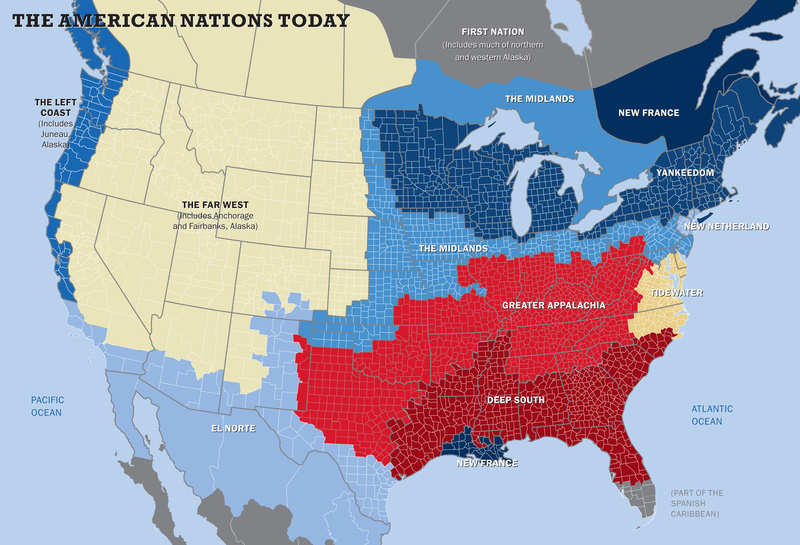 For more than 250 years, he wrote, American history has been shaped by the basic conflict between regions he calls Yankeedom and Deep South, and the shifting alliances among the other regions. Yankeedom, heirs of the Puritans of Massachusetts Bay. New Netherland, heirs of the tolerant, commercial Dutch culture of New Amsterdam. Midlands, heirs of the tolerant culture established by Quakers in the Delaware Bay. Tidewater, heirs of the aristocratic culture established by Cavaliers around the Chesapeake Bay. The Left Coast, heirs of New England Yankees who settled the Pacific Northwest. The Far West, heirs of the varied pioneers who settled this harsh region. El Norte, heirs of the original Spanish settlers of northern Mexico and the American Southwest. New France, heirs of the original French-Canadian settlers and their Cajun cousins. First Nation, heirs of indigenous peoples of the Far North. I recently finished reading his book, American Nations: the Eleven Rival Regional Cultures of North America (2011), on the recommendation of my friend, Janus Mary Jones. I think the regional rivalries he described are real. I learned things I hadn’t known. But I think he errs in trying to interpret American history exclusively in terms of regional conflict. 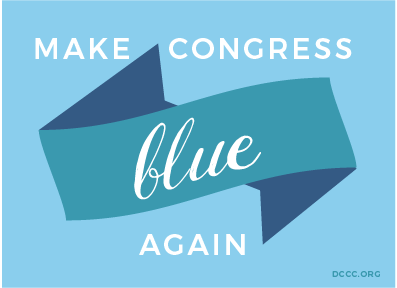 Source: RoseAnn DeMoro on Twitter. 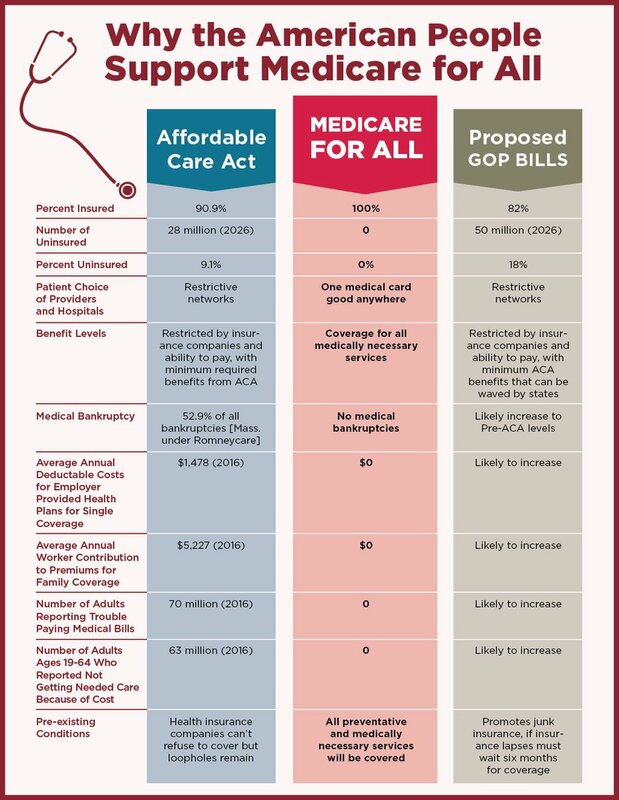 The downside of Medicare for All is that government spending will increase. Various studies indicate that overall spending will be less. Because Donald Trump seems so undisciplined and ignorant, I continually underestimate his effectiveness. I didn’t think he would be nominated. I didn’t think he would be elected. And sometimes I fool myself into thinking it is better to have Trump in the White House than somebody with the same agenda, but more competent. This is a mistake. In order to do good, you need not only good will, but intelligence and hard work, but that in order to do harm, all you need is malice. 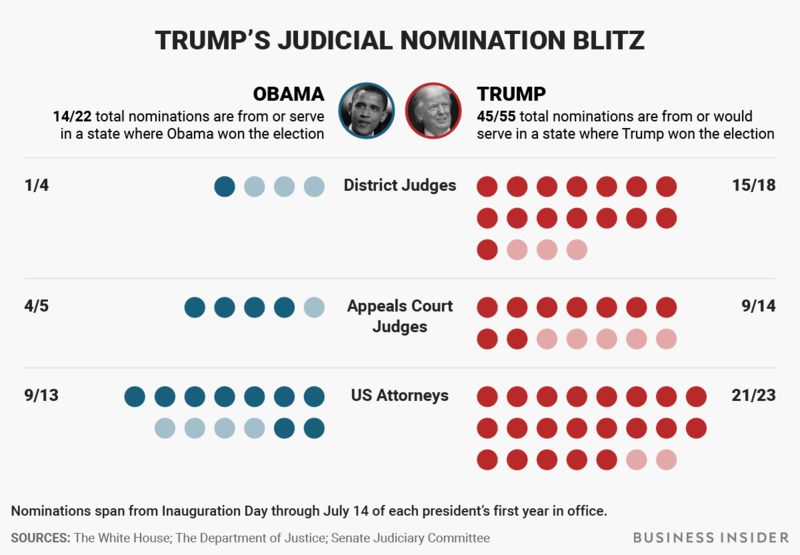 >>>Donald Trump has left many key positions in government unfilled, but is moving forward at a rapid pace to nominate federal judges and U.S. attorneys. The judges will be in office possibly decades after Trump is gone. District judges and appeals court judges are almost as important as Supreme Court justices because most cases don’t reach the highest court. Many of Trump’s executive orders have been blocked by court rulings. Putting his own people on the bench lessens the likelihood that this will happen. The bulk of his nominations have been in states represented by Republicans. Customs of the Senate allow a Senator to block a judgeship nomination. Concentrating on Republican states is smart because it means he can get a lot of his people approved before turning to the Democratic states. Donald Trump is said to have asked his lawyers for their opinion on whether he has the power to pardon himself. Article 2, Section 2. The President … shall have the power to grant Reprieves and Pardons for Offences against the United States, except in Cases of Impeachment. Article 2, Section 4. The President, Vice President and all civil Officers of the United States shall be removed from Office on Impeachment for, and Conviction of, Treason, Bribery or other high Crimes and Misdemeanors. Article 1, Section 3. 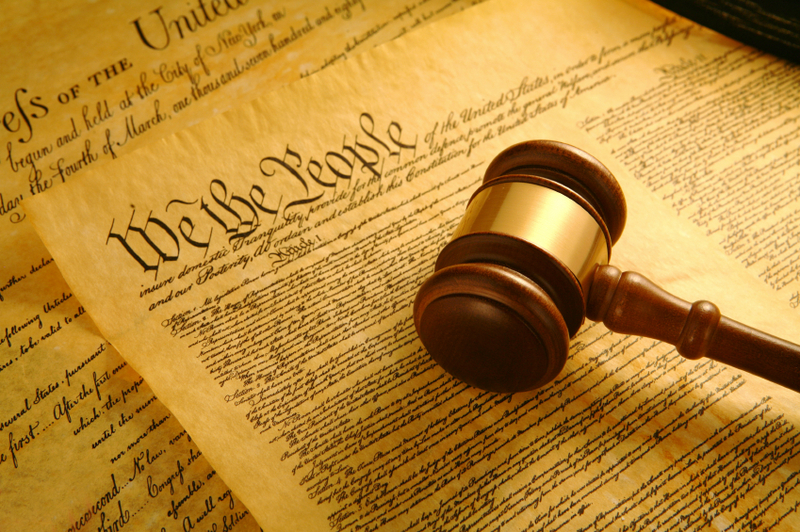 … Judgment in Cases of Impeachment shall not extend further than to removal from Office and disqualification to hold and enjoy any Office of honor, Trust of Profit under the United States: but the Party convicted shall nevertheless be liable and subject to Indictment, Trial, Judgment and Punishment, according to Law. What I take this to mean is that the Founders never thought about the possibility of a President pardoning himself. It’s a settled principle of law that no-one should be judge in their own case, but I’m not bold enough to say how the courts would decide this issue. If President Trump had the authority to pardon himself, could he literally stand in the middle of Fifth Avenue, shoot someone and then pardon himself for the crime of homicide? No. The pardon power extends only to federal crimes. In this thought experiment, he could still be prosecuted under New York state law. The pardon power does not extend to impeachment, but the only penalty under impeachment is removal from office. For all practical purposes, there is no way to hold a criminal President accountable except through the impeachment process. This is a trailer for the forthcoming movie “Awaken,” which is supposed to be a celebration of humanity’s relationship to technology and the natural world. I don’t know what the following images add up to, but, like Jason Kottke, I think they are lovely to look at. 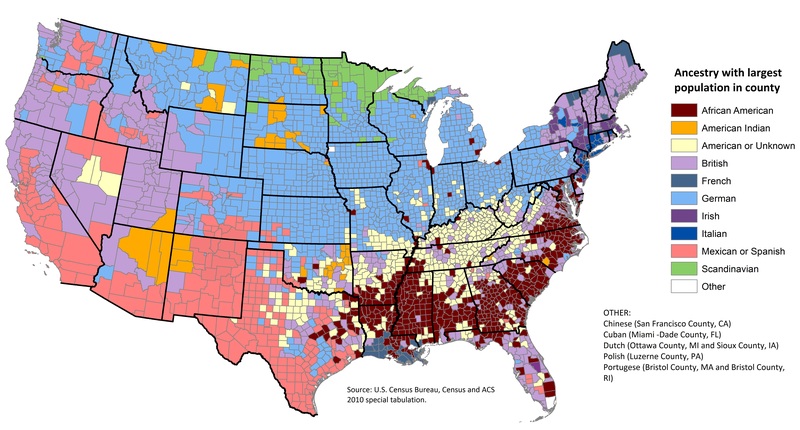 My previous five posts are about the origins of American regional cultures and how regional identity affects politics and society. The maps above are a reality check. It shows the hypothetical outcome of the 2016 election if only certain groups of people had been allowed to vote. 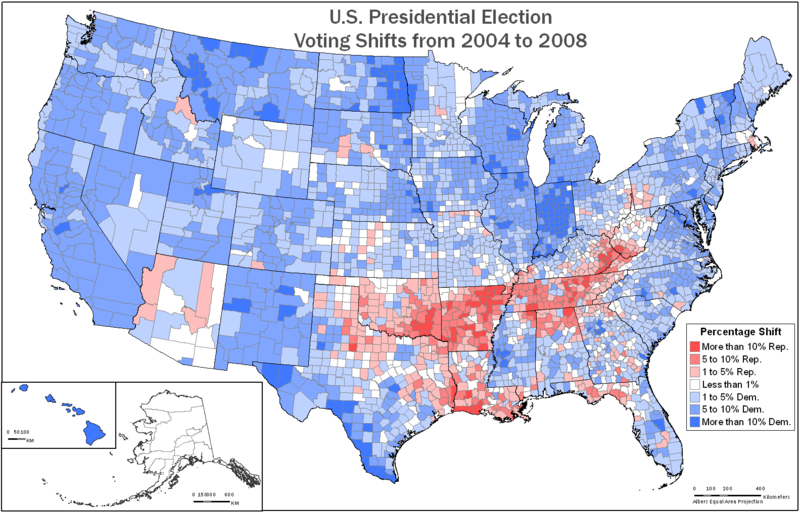 Regional distributions of Democratic and Republican strength mostly remain the same, but the outcomes are considerably different. If only people of color voted or only women voted, Democrats would have won in a landslide. 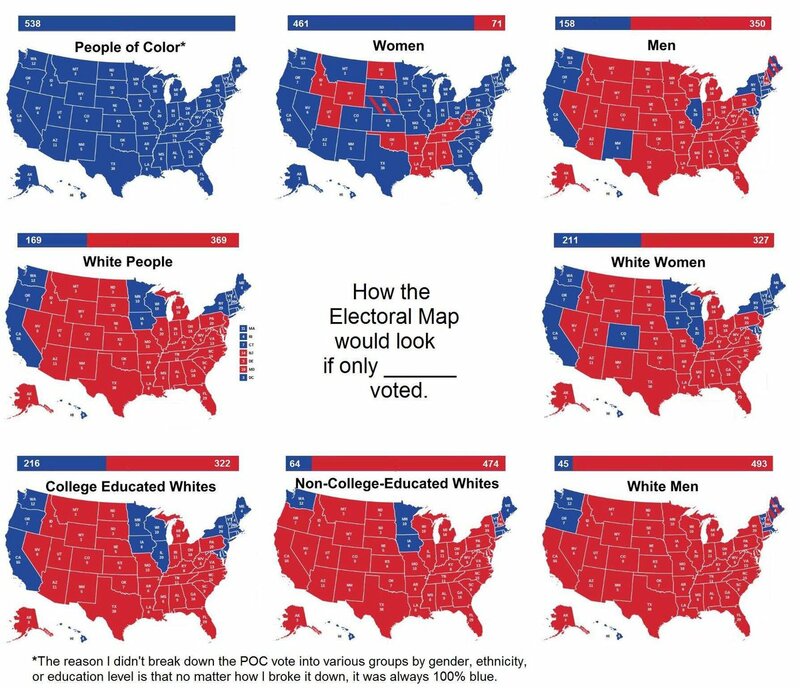 But if only whites voted or only men voted, the landslide would have been Republican. The hardscrabble people of northern England, the Scottish lowlands and Ulster were cannon fodder for the English-Scottish and English-Irish border wars. They were uncouth, fierce, stubborn and rebellious, and hard to get along with. When the border wars ended, they were encouraged to leave for colonial America. Once here, they were encouraged to leave the coastal settlements for the Appalachian back country. 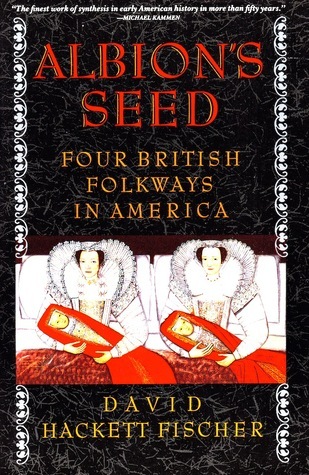 David Hackett Fischer, in Albion’s Seed, wrote that they were the last of the four great British migrations whose folkways became the basis of American regional cultures. Fischer stated that each of the folkways had its own concept of freedom. The Puritans of Massachusetts Bay believed in ordered freedom, the right of communities to live by God’s will and their own laws. The Cavaliers of tidewater Virginia believed in hegemonic freedom, the power to rule and not be ruled. The Quakers of the Delaware Bay believed in reciprocal freedom, the duty to allow others all the freedoms you want for yourself. Their desire for natural liberty put them in the forefront of the American westward movement. Kentucky and Tennessee became states before Ohio and Alabama were barely settled from New England and the deep South. They provide our image of the pioneer West. Daniel Boone, Davy Crockett, Sam Houston and Kit Carson were products of the Appalachian culture. Together with the indentured laborers of the Deep South, they also provide our image of poor white people. David Hackett Fischer argued in Albion’s Seed that the United States is the product of four relatively small groups of migrants to the 17th and 18th century Atlantic seaboard. The first wave, John Winthrop’s Puritans, established a repressive theocracy in Massachusetts Bay. The second, Sir William Berkeley’s Cavaliers, established a haughty and repressive aristocracy in tidewater Virginia. But the third wave, William Penn’s Quakers, established a community around the Delaware Bay based on values that most 21st century Americans could accept. Quakers believed that all human beings possess an Inner Light which enables them to establish a relationship with God. They lacked the Puritan sense of sin and the Cavalier sense of hierarchy. The Quakers opposed war, opposed artificial distinctions among human beings and opposed religious persecution. They did not weigh down their children with a sense of sin, like the Puritans, nor encourage self-centered pride, like the Cavaliers. They came the closest of any of the colonists to practicing social equality and equality within marriage. Like the Puritans, they were extremely austere and enforced strict standards of behavior within their group. But their method of enforcement was shunning—not the whipping post or the stocks. Pacifism and toleration are not good memes for staying in power, and the Quakers in a few generations lost positions of power in Pennsylvania, New Jersey and Delaware. But they continued to influence the general American culture. They were the first and foremost opponents of slavery and advocates of women’s rights in the early 19th century USA. In all of the great New England movements for humanitarian reform, whether regarding prison inmates, the insane or even animals, the Quakers were there first. I don’t, however, see the Quakers as the founders of a regional culture—unlike the New England Puritans, Virginia Cavaliers and Appalachian borderers. The Cavalier settlers of tidewater Virginia were noted for their strong sense of rank—much more so than the Puritans, Quakers or Apppalachian borderers. That is a heritage that continues today. Rank in the old army sense of “rank has its privileges”. Rank in the sense of expecting men to take off their hats and women to curtsey in your presence. Rank based not just on wealth and power, but on hereditary privilege. This was idea behind the 17th and 18th century English class system, based on the idea of the “great chain of being.” God was at the top, then the King who ruled by divine right, then the different ranks of aristocrats, yeomen and tenants. David Hackett Fischer wrote in Albion’s Seed that the early Virginia settlers, of all the North American colonists, were the strongest royalists and the most committed to aristocratic privilege. The Appalachian borderers talked to each other as if they were equals, but they respected wealth and power men who were strong enough to acquire it and hold on to it. But the Virginia Cavaliers, whose families warred with the Puritans back in Britain, imported the English rank system in all its glory. Fischer said the Virginians believed in what he called “hegemonic freedom.” The idea is that you are free to the extent that you have power over other people and nobody has power over you. The Puritan colony in Massachusetts Bay was a much more thoroughgoing theocracy than modern-day Iran. The Puritan leaders not only banned all religious worship except their narrow version of Calvinism. They screened newcomers for religious orthodoxy. Sunday religious worship was compulsory. They might jail or fine you for such offenses as wasting time. It’s true, as David Hackett Fischer pointed out in Albion’s Seed, that established churches and religious persecution were the norm in 17th century Europe and its colonies. Virginia and the other southern colonies, like New England, had tax-supported established churches. The settlers on the Appalachian frontier settlers did not hold with established churches, but they were quick to drive out any clergy whose preaching didn’t meet with their approval. Only the Quakers of the Delaware Valley embraced the radical idea of tolerating religious teachings they thought to be in error. But the Puritan religion was exceptionally narrow, austere and joyless. It was about human sinfulness, the threat of hell, policing each others’ behavior and listening to hours-long sermons on hard benches in unheated churches. The Anglican religion of tidewater Virginia, in contrast, involved a rich liturgy, 20-minute sermons and many feast days. The flowering of New England culture was the result of a revolt against this Calvinist orthodoxy at the dawn of the 19th century. Transcendentalists rejected original sin, and taught that we all have a divine spark within us. In that respect, their theology was more like the Quaker doctrine of the Inner Light than it was like the old-time Calvinism. Humanitarian reformers sought to bring about the Kingdom of God by championing the cause of the blind, the deaf, the mentally ill, the American Indian and the black slave. There, too, New England Congregationalists and Unitarians followed in the footsteps of Quakers. The things the Yankee reformers retained from Puritanism were moral and intellectual seriousness, belief in education and self-government, and commitment to collective action. One of the first fruits of the flowering of New England was the emergence of the Republican Party, which was formed to oppose the spread of slavery. Almost all the famous New England writers and reformers were Republicans. A New Englander once told me about traveling in the South, and stopping at a convenience store to ask for directions. Even though there was a long line of people waiting to be served, the clerk came out from behind the counter and did everything she could to make sure the traveler was properly oriented. The waiting customers did not resent this. Instead they joined in and tried to assist the clerk. A New England clerk would not have done this, my acquaintance said. It is not that the New Englander would have been less concerned. It is just that a Southerner would regard hospitality to a stranger as the first obligation, and a New Englander, equally kind, would have made sure that customers were served. We Americans are very conscious of our regional differences. I wonder if they’re apparent to foreigners. We have sayings, such as: If you introduce yourself to New Englanders, they’ll ask where you went to school; to New Yorkers, they’ll ask what you do for a living; to Southerners, they’ll ask what church you attend; to Minnesotans, they’ll not ask personal questions of a stranger because that’s impolite. Recently my friend Janus Mary Jones lent me a copy of ALBION’S SEED: Four Regional English Folkways in America, a fascinating 1986 book by a historian named David Hackett Fischer, which attempts to explain American regional differences in terms of colonial origins. Fischer made the bold claim that the seeds of present-day American culture were planted by four relatively small groups of migrants from different regions of England at certain periods of history, and that American history is largely the flowering of these seeds. 21,000 Puritans who left East Anglia for Massachusetts Bay in 1621-1640. 45,000 Cavaliers and their servants who left southern and western England for tidewater Virginia in 1642-1675. 23,000 Quakers who left the English Midlands, along with German Pietist allies, for the Delaware Valley in 1675-1713. Although few in number originally, these colonists multiplied and spread, Fischer wrote, and they established the cultural frameworks to which later migrants had to adapt. These cultures were very different from each other and also very stereotypical, Fischer wrote. The Puritans were very puritanical, the Cavaliers were very haughty and aristocratic, the Quakers were very plain and peaceful and the Appalachian borderers were very rebellious and violent. None of these qualities originated in North America. They all had roots in their British places of origin. A blogger named Scott Alexander has written an informative and readable revew describing these four cultures. Rather than try to summarize, excerpt or improve on what Alexander wrote, I will just link to his post. I think the impact of these four original settlements was important, but I don’t want to exaggerate. Present-day Americans have more in common with each other than we do with 17th and 18th century Puritans, Cavaliers, Quakers or Appalachian backwoodsmen. Kris Kobach, the vice chair of the Presidential Commission on Electoral Integrity, is one of the chief proponents of the infamous CrossCheck system that may have led to wrongful cancellation of voter registrations of thousands of Americans. As Secretary of State of Kansas, he claimed that there were large numbers of voters who were registered in two or more states and voted in two different states on the same day. The supposed solution to this was to compile lists of names of voters with similar names, and to assume that they were the same person. CrossCheck has compiled a list of 7 million paired names—which Kobach says means there are 3.5 million potential double voters. This is the basis of Donald Trump’s charge that 3 million people voted illegally for Hillary Clinton in 2016. Investigative reporter Greg Palast said 1.1 million voter registrations have already been deleted as a result of CrossCheck. Palast said the names are skewed toward typically black names, such as Jackson, and typically Hispanic names, such as Hernandez. During the 20 years I reported on business for the Rochester (NY) Democrat and Chronicle, I was surprised at how many people were afraid to speak freely because of the consequences to their careers or chances of getting a job. Self-employed professionals such as physicians and lawyers. Self-employed craftsmen such as plumbers and electricians. Civil servants (provided they were speaking about their area of responsibility and not political issues). Labor leaders and members of strong labor unions. Many years ago I read David Kearns’ memoir of his years as CEO of Xerox Corp. (I no longer have the book and don’t remember the title). In one chapter, he described a meeting he held with workers at Xerox’s Webster, N.Y., plant about problems with a new model of copier. My impression is that Kearns thought he deserved credit for not getting angry at the union representative. But, actually, what he should have done was to arrange to meet with him once every six or twelve months. If you are in a position of authority, someone who will tell you the truth is invaluable. But few in a position of authority want to hear inconvenient truths. Hence functional stupidity. 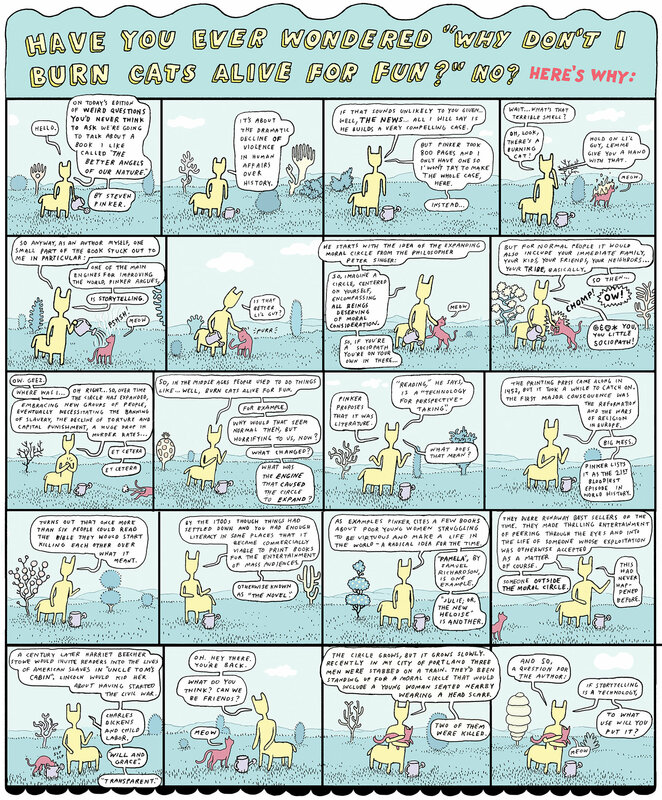 Tags:David Kearns, Free Speech, Functional Stupidity, Labor Unions, The Stupidity Paradox, Xerox Corp. But although employers require ever-higher levels of academic credentials, this is not reflected in the work itself. College graduates wind up doing work that high school graduates once did, and high school graduates do work that school dropouts once did. In the early 20th century, businesses adopted a practice called Taylorism—resolving factory work into the simplest, most basic, mindless human motions. Now we have McDonaldization—resolving service work into the following of simple checklists. Mats Alvesson and Andre Spicer, in their 2016 book, THE STUPIDITY PARADOX: The Power and Pitfalls of Functional Stupidity at Work, attribute this to the tendency of organizations to suppress critical thinking because of their need for obedience to orders and smooth internal functioning. What they write is true as far as it goes, but organizational stupidity is more than a simple mistake in setting priorities. Organizational stupidity is maintained by powerful vested interests. Knowledge is power. If I am a supervisor and my subordinate is more knowledgeable and competent than I am, that diminishes my power. What college graduate, fresh out of business school, wants to be contradicted by some grouchy old skilled craftsman, who has less schooling but may know more than he does? Harry Braverman, in Labor and Monopoly Power and David Noble, in America by Design and Forces of Production, described the de-skilling of the American work force and the development of technologies devoted to increasing command and control by management rather than increasing productivity as such. The more knowledgeable and skilled a worker is, the more power the worker has in relation to the employer, both as an individual and as a member of a labor union. So knowledge and skills aren’t necessarily wanted except where they are indispensable. A friend of mine who went back to school in mid-life to get an advanced degree in his specialty discovered that employers did not want his new skills. What they wanted, he said, was “a jack of all trades who would work cheap.” Employers see more benefit in having replaceable workers than in having productive workers. You need to be remarkably intelligent to be functionally stupid. So why do corporations and other big organizations do so many stupid things? No big organization could function efficiently if everybody in it thought critically and independently about everything they did. The whole point of hierarchy is to enable obedience to orders on a large scale.. In a hierarchy, employees have to teach themselves to focus on their own jobs and not worry about the big picture. Otherwise the organization wouldn’t function smoothly. Functional stupidity reduces conflict, soothes anxiety, improves morale and increases self-esteem. The problem is when the organization is blind-sided by reality. The philosopher John Dewey said that all human action is the result of impulse, habit or reasoning. It is not humanly possible to reason out every single aspect of life, according to Dewey. We turn to reason when our habitual ways of acting or thinking fail us. Why do people in big organizations so often fail to turn to reason before it is too late? 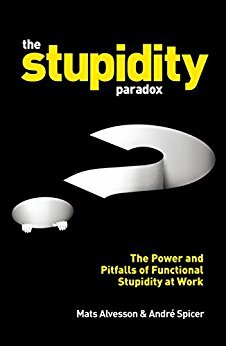 In their 2016 book, THE STUPIDITY PARADOX: The Power and Pitfalls of Functional Stupidity at Work, Mats Alvesson and André Spicer identify five categories of functional stupidity. In contemporary organizations, it’s thought that the duty of an executive is not only to manage, but to inspire. Leaders are supposed to be “change agents.” But change can be either good or bad, depending on circumstances. Adolf Hitler, after all, was a transformational leader. Executives can waste their time engaging in what they think is inspirational leadership to the detriment of their tasks as managers— budgeting, assigning work, quality control, employee evaluation and so on. Most employees, according to Alvesson and Spicer, don’t want leadership. They just want to be left alone to do their jobs. Former diplomat Peter Van Buren reported on his web log how the U.S. Department of Defense rejected claims by U.S. troops who were irradiated during rescue efforts at the Fukushima nuclear power plant disaster. It has fallen to a former Japanese prime minister to come to their aid. The U.S. Navy rushed thousands of troops to the scene in 2011 to help Japanese disaster victims, after an earthquake and tsunami caused meltdown of the Fukushima plant. A few years later, hundreds of them began to report symptoms of radiation disease—rectal and gynecological bleeding, thyroid problems, leukemia and testicular and brain cancers, Van Buren said. Some had worked in the area of the nuclear disaster, some had flown over it and some had drunk desalinated sea water from the contaminated ocean. The U.S. Department of Defense, relying on information from the Tokyo Electric Power Co. (TEPCO), said they couldn’t possibly have received high enough levels of radiation to be harmful. Some 400 service members are suing TEPCO, but this lawsuit will take years to resolve, and seven of the plaintiffs already have died. 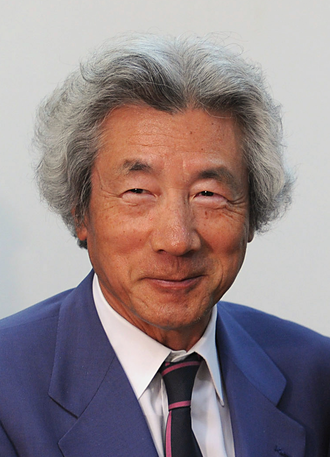 Former Prime Minister Junichiro Koizumi, who left office five years before the disaster, has started a fund-raising appeal to raise $1 million to help the U.S. veterans pay medical bills. Van Buren said Koizumi already has raised $400,000 through lecture fees. As an American, I am grateful to Prime Minister Koizumi and ashamed of this example of U.S. government neglect of American veterans. Abandoned by U.S. Government, Irradiated Servicemembers Turn to Japan for Help by Peter Van Buren for We Meant Well. 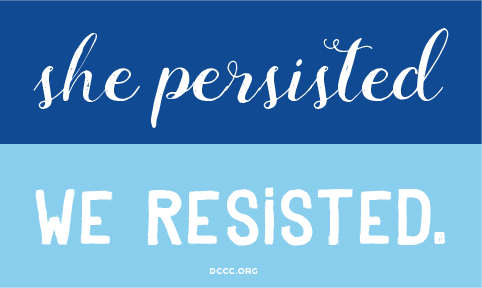 The Democratic Congressional Campaign Committee, as part of a fund-raising e-mail, asked donors to vote on which of the following they prefer for the next DCCC bumper sticker. They illustrate what’s wrong with the Democratic Party. What’s noteworthy about these slogans is that they are almost empty of content. 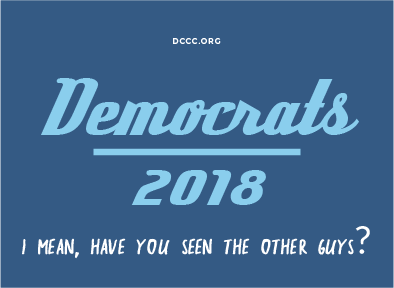 They only point they make is that Democrats are not Republicans. This actually is the main Democratic talking point. The middle two refer to an incident that most voters have probably forgotten or didn’t notice in the first place. 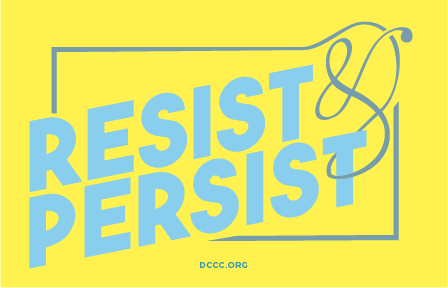 Also, in the context of present-day American politics, Resistance as a political stance is a defense of the status quo. It doesn’t offer a path to anything better. To show what I mean, here are meaningful slogans. I have a much longer list of issues in mind, but you get the idea. Of course the present leaders of the Democratic Party would never adopt such slogans, and not just because they would open up so many incumbent Democrats to charges of hypocrisy. 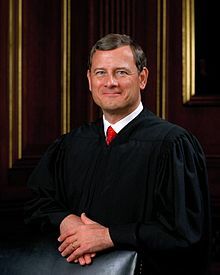 Chief Justice John Roberts gave a commencement speech this year to his son’s graduating class at the Cardigan Mountain School, a boarding school in New Hampshire for boys in grades six through nine. I hope you’ll be ignored so you know the importance of listening to others, and I hope you will have just enough pain to learn compassion. Whether I wish these things or not, they’re going to happen. And whether you benefit from them or not will depend upon your ability to see the message in your misfortunes. Some 35 years ago, there was an International Dull Men’s Club whose chairman was J.D. Stewart, a statistical analyst for Eastman Kodak Co. here in Rochester, New York. That was in 1982, a year of peak dullness and boring prosperity for both Rochester and Kodak. Since then Kodak has gone bankrupt, which has made life around here more “interesting” in the sense of the ancient Chinese curse. The club was formed largely as a joke, but with an underlying idea of honoring people who enjoy mundane things and who do mundane but necessary work. Stewart would do things like publishing a list of the 10 dullest Americans (including Don Rickles, Gerald Ford, Lawrence Welk, Walter Mondale, Fred Rogers and Garfield the cat) and proposing seminars on topics such as “dressing to break even” and “non-assertiveness sensitivity training”. The video above shows how the Dull Men’s Club concept has been revived in Great Britain. The club blog is devoted to safe excitement, an outstandingly dull concept. I do have to say that the British devotion to dullness is incomplete. The new Dull Men’s Club is devoted to unusual hobbies, some of which seem actually interesting. There is a woman whose hobby is to follow brown road signs, wherever they might take her. That could lead to actual adventures, which is contrary to the spirit of dullness. 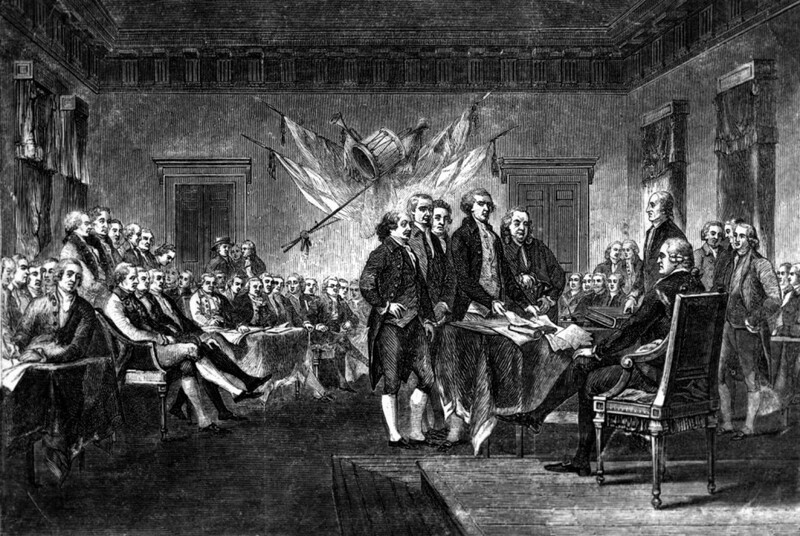 National Public Radio has a long-standing custom of broadcasting the Declaration of Independence every Fourth of July. This year NPR sent out the Declaration of Independence on Twitter, and was accused of sending out radical propaganda. They thought the Declaration referred to President Trump, not King George III. It goes to show that the Declaration of Independence and the U.S. Constitution are like the Bible. More people say they believe in them than actually reading them. I can remember newspapers years ago doing man-in-the-street interviews about excerpts from the Declaration or the Bill of Rights, and showing how many average Americans regarded their country’s founding ideals as dangerous and radical. Actually, this country’s founding ideals are dangerous and radical, but in a good way. Some Trump supporters thought NPR tweeted ‘propaganda’ | It was the Declaration of Independence by Amy B. Wang for The Washington Post. The world is my country, all mankind my brethren and to do good is my religion. 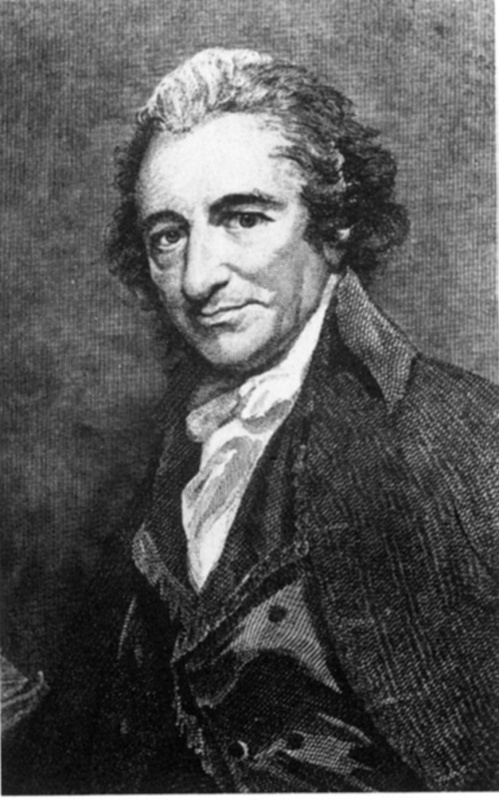 Thomas Paine, born an Englishman, was an early advocate of American independence and a morale officer for George Washington’s Continental Army. Later he traveled to France and became an advocate for the French revolutionaries, returning in old age to the new nation of the United States of America. He said he considered himself to be a citizen of the world, but of no particular country. A number of posters on one of my favorite Internet sites, as well as a couple of my acquaintances, aspire to be like Thomas Paine. Although born American citizens, they disavow allegiance to the United States, which they see as a nation founded on slavery of African-Americans, ethnic cleansing of native Americans and enfranchisement of white Anglo-Saxon property-owning males. None of them, so far as I know, make any actual effort to shed the legal privileges and responsibilities that go with American citizenship. The question is whether shedding nationality is even possible. European acquaintances, and friends who’ve spent time in Europe, tell me that Americans are instantly recognizable wherever we may be—by our gait, our body language, the way we speak English and our basic attitudes toward life. These are not things that are so easy to get rid of! The black writer James Baldwin traveled to France in the late 1940s and early 1950s to seek refuge from American racism. What he came to realize, as he wrote in an essay collection called Notes of a Native Son, is that whatever else he was, he was an American. 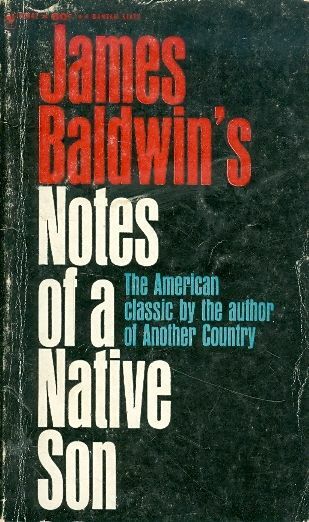 Baldwin felt a strong solidarity with African students who hated French colonialism. But he himself understood that he was an American, an African-American—not an African in exile. He said the idea that nationality is a matter of personal choice is a specifically American idea. … the American … very nearly unconscious assumption that it is possible to consider the person apart from all the forces that have produced him. This assumption, however, is itself based on nothing less than our history, which is the history of the total, and willing, alienation of entire peoples from their forebears. What is overwhelming clear, it seems, to everyone but ourselves is that this history has created an entirely unprecedented people, with a unique and individual past. It is the past lived on the American continent … … which must sustain us in the present. The truth about that past is not that it is too brief, or too superficial, but only that we, having turned our faces so resolutely away from it, has never demanded what it has to give.